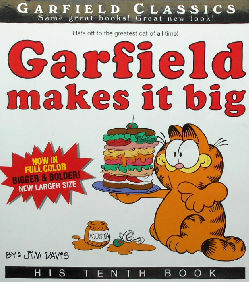 The sub-title of the book is "Garfield's Loves & Hates". It is a collection of the early years of Garfield comic strips. The strips are reproduced in color in this his 10th book. The paper back book is 8 1/2" wide x 9" high. 96 pages. Copyright 1985 and 2005. Previously owned but in good condition.